I posted about the available birthday cakes for Jollibee party. Each Jollibee party theme (My Best Friend Jollibee, Jollitown, Hello Kitty, and Batman) has its own cake design. Jollibee party birthday cake is made by Red Ribbon Bakeshop, so you are assured that it is delicious. The birthday cake comes in two sizes: medium (8 inches by 12 inches) and large (12 inches by 12 inches). It also comes in two flavors: chocolate and mocha. 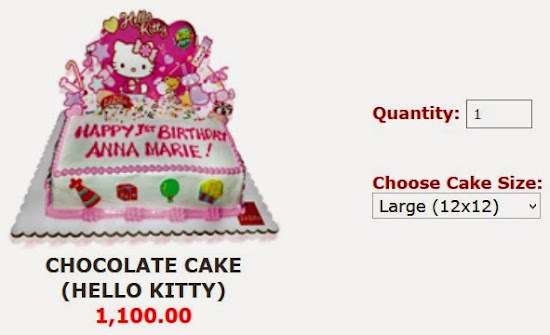 Take note that Jollibee party birthday cake may not be available in Jollibee branches. Jollibee allows you to place the name of the birthday celebrant and your special message. You can also give special instructions regarding the birthday cake. The price of birthday cakes for Jollibee Party is not included in the party fee nor the price of the food package that you will select for the Jollibee party. The birthday cake has its own price. Jollibee party birthday cake that is medium in size costs 900 pesos. This 900-peso price applies to both mocha and chocolate flavored cake. The price is the same for all Jollibee party theme. Jollibee party birthday cake that is large in size costs 1,100 pesos. This price applies to both mocha and chocolate flavored cake. The price is the same for all Jollibee party theme.